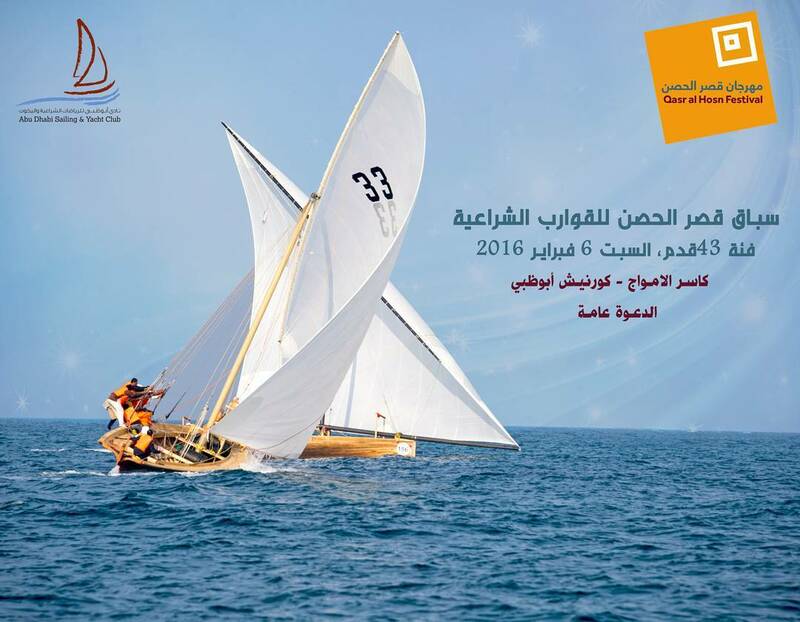 Abu Dhabi Sailing & Yacht Club organizing Qasr Al Hoson Dhow Race ON Saturday 6 February, 2016 celebrating with Qasr Al Hoson Festival .The Race will start at 2:00pm, 20 Nautical Miles ending in Abu Dhabi Corniche near breakwater. Our Club invites all lover of Dhow sailing to follow & join our competition near the breakwater. A step up from the 22ft Dhow is the 43ft Dhow sailing class. Still rigged with a single mast, the dhows are crewed by 10 to 14 sailors. In accordance with local tradition, the boats are built of wood and the length of the keel is fixed at 43ft. The mast and rigging is less traditional and has been upgraded with modern technology. This break from tradition is mainly due to safety reasons as the traditional wooden mast is too heavy and fragile to be used in racing. 43ft Dhow races are held over a distance of approximately 15 Nautical Miles. The race usually has between 80 and 100 dhows at the start line. The dhows race either in a straight line or a gybing course to the finish line near the Abu Dhabi Breakwater. The Championship hosted by Abu Dhabi Sailing & Yacht Club is comprised of 3 races throughout the year.